Learning Goal: Identify the MAIN causes of WWI. Explain the spark that started the war. Bellwork: List 2 things you know about WWI. 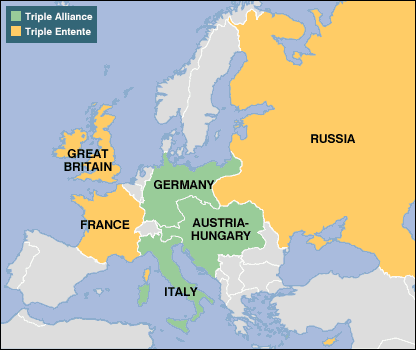 Learning Goal: Describe the web of Alliances during WWI. Bellwork: What does MAIN stand for? Students watched 2 video clips about the alliance systems that lead to WWI. The demonstrated these systems with a yarn activity. The filled in the maps on page 2 of their unit packet. Learning Goal: Explain the impact of new weapons on World War I.
Bellwork: What is the "spark" that started the war? Students read about how new technology and new weapons were used in WWI. Students were introduced to the WWI Weapons Infograph assignment. They were assigned a weapon to research; airplanes, tanks, machine guns, or U-Boats. The infograph assignment is due at the end of the period on Friday. Learning Goal: Create an infograph detailing a weapon used in WWI. Bellwork: Grade the infograph on the SB using the technology rubric. Students researched weapons used in WWI. They began creating an infograph detailing what they had learned. This assignment will be finished in class tomorrow. Learning Goal: Create an infographic detailing a weapon used during WWI. Bellwork: Who were the members of the Allies? 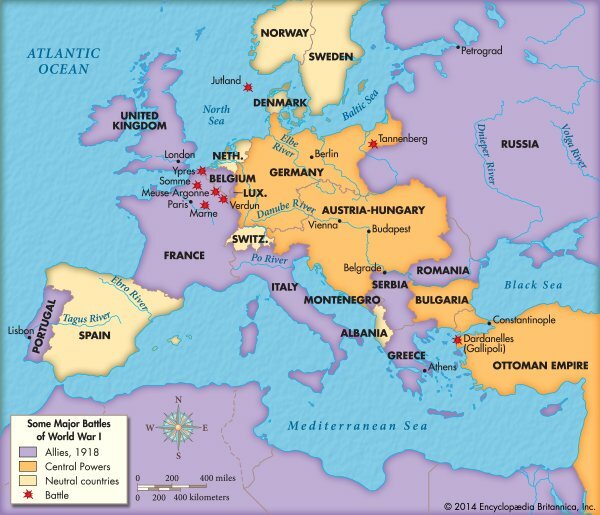 Who were the members of the Central Powers? Students finished their infographics and turned them in. Learning Goals: Explain how technology changed the war. Describe trench warfare. Bellwork: List 5 weapons used for the first time during World War I. Students finished their Weapon Infograph. Students watched a short video on the weapons of WWI. Students learned about trenches and how they were used in battle during the war. We then watched a Mythbusters video on why trenches were designed like they were. Learning Goal: Describe trench life during WWI. Bellwork: Why are trenches designed at 90 degree angles? Students read the article "Life in the Trenches" and filled in page 6 of their unit packets. Learning Goals: Describe life in the trenches during the war. Identify the major battles fought along the Western Front. Bellwork: Create an unique/original word for life in the trenches. Students reviewed the answers for page 6 of the unit packet. Students learned about the Christmas Truce on the Western Front on Christmas in 1914. Students used an interactive map from a BBC site to fill in packet page 5. Learning Goal: Describe the daily life of a soldier. Bellwork: What makes an interesting letter. Students read 4 primary source documents from WWI British soldiers stationed on the Western Front writing home to their families. Students discussed with their groups and wrote down observations about the letters. Tomorrow students will write a RAFT from the perspective of a soldier writing home to their family. Learning Goal: Explain the life of a WWI soldier on the Western Front. Bellwork: What is the Western Front? Students were given a RAFT assignment to write from the perspective of a British soldier serving on the Western Front. Students were given 10 vocabulary words to incorporate in the RAFT. This assignment is on Google Classroom and is due Friday. They will also be given the class time tomorrow to work on the assignment. Students worked on their RAFT - Letter Home. The letter assignment is in Google Classroom and due by Friday. Students were told that there will be a WWI quiz on March 10th. They were given a Study Guide copies of which can be found under 7th grade homework. Learning Goal: Explain the events that lead the US to join WWI. Bellwork: What are good reasons for a country to go to war? Students read in their textbook pages 708-711. They filled in packet page number 7. Students were assigned a Pro or Con position to the question "Should the US join WWI?" They filled in a graphic organizer they will use in a debate on Friday. They had a support material handouts in class, the textbook, their unit packets and the internet to put together their position. Students were assigned a Pro or Con point of view about whether the US should enter WWI. There was a debate in class. Students had to make a claim and support their position. Learning Goal: Describe the "Home Front". Bellwork: List 3 reasons the US entered WWI. Students were reminded that there is a quiz on Friday. There is a study guide under 7th grade homework. Students were told that the last day to accept late work for the 3rd quarter is Thursday at 3pm. Students reviewed their answers for packet page 7. Students read in the textbook pages 712-715. Bellwork: Write 1 sentence using 2 of the words displayed on the SmartBoard. Students practiced essay question #2 about life in the trenches. They then finished packet page 8 of the unit packet. Students discussed the use of propaganda to influence people into supporting the war effort. Learning Goal: American's involvement in the war. Bellwork: Students walked around the class looking at WWI propaganda posters. Students read in the textbook page 712 - 715 about America's involvement in the war. Students took notes from the attached Powerpoint and filled in packet page number 9. Learning Goal: Explain Wilson's 14 Points and the Treaty of Versailles. Bellwork: Students looked at their SS grades and checked for missing work. Students practiced writing an essay on the topic of how Americans fought the war on the Home Front. Students learned about American hero Sgt. York then watched a short video clip on him. Students got into self selected groups and wrote a treaty to end WWI. Students were told that the WWI quiz has been moved to Monday. Bellwork: List 2 battles the US fought in during WWI. Students shared out their ideas of what should be in the treaty to end the war. Students learned what President Wilson's ideas were to be put in the treaty. Students learn what was put into the treaty that ended WWI. Students played a Kahoot game to review for the quiz on Monday. Bellwork: List the 3 main members of the Allies at the start of the war. Learning Goal: Create a memorial that includes aspects of the WWI experience. Bellwork: What memorials have you visited and what was their purpose? Students were introduced to the WWI Memorial Common Assessment. We reviewed the requirements, rubrics and discussed elements of other national memorials. Learning Goal: Create a memorial for WWI. Bellwork: What ideas do you have for your memorial so far? Students continued their work on the WWI Memorial Common Assessment. Today they worked on their Planning Page. Then students began drawing out their memorials. Learning Goal Create a memorial for WWI. Students continued to draw and color their memorials. Learning Goal: Create a WWI memorial that communicates a message of America's experience in that war. Bellwork: In one sentence write down the main theme or idea of your memorial. Students began writing their support for the memorial they created in Google Classroom. This is a common assessment so all work on this project must be completed in the classroom. This assignment is due at the end of the period tomorrow. Learning Goal: Create a WWI memorial that communicates a message of America's experience in the war. Bellwork: Be specific, where is your memorial being built? Students finished their memorial drawings and written explanations and turned them in during class today.